Simply Easy DIY: A whole new DIY world!!! A whole new DIY world!!! A little over eleven years ago my wife and I became first time homeowners. We were excited as anyone would be. It was not long after we moved in that we realized we needed storage...and lots of it. Buying ready made storage from a store or having someone build it for us was both impractical and expensive. A growing family with a new mortgage needed to live on a budget. The practical solution was for me to build it and in so doing I could customize the new storage for our specific needs. The only problem with that was that I had no knowledge or experience of building anything. I hadn’t even taken a shop class in high school. A second problem was that I only had one power tool, a Black and Decker screwdriver that ran off of double A batteries. Oh yes, we had a headwind, but I have never been afraid of a challenge. So, I with all of my stubbornness, pushed forward with a diy plan. I had no idea that I would come to love what was ahead. One of the first power tools that any DIY'er and more specifically a woodworker adds to their collection is a table saw. I was no different, I soon realized the need and practicality of having such a tool in my garage. I soon went out to my local home improvement store and bought the best, cheapest table saw I could find. Actually my choice probably had more to do with the latter more so than the former. Sometimes it’s hard to admit your mistakes. We try to find all sorts of rational in order to justify our decisions. My mistake was not seeing what I needed to be looking at. I saw the price tag and nothing more. If there is a piece of advice I could give to anyone looking to get into woodworking or diy projects in general, its to look at every tool as an investment. Don’t get me wrong, just because a tool costs more does not automatically make it better and it certainly does not make it a better choice for your situation. On the whole however, spending a few extra dollars to get a tool that fits you and not your wallet is always a wise decision. I bought a 10” Ryobi table saw for around $100. To be quite fair the major issue that it has is the same issue I view most table saws at or near this price range have, a tiny table top. However, in keeping with my fairness; that is sort of the point of a portable job site table saw. The key word being “portable”, they are meant to be easily moved from site to site. The manufacturer does not build them to handle full sized sheet goods or for precision joinery right out of the box. I’m not exactly sure who thought up the idea of taking a powerful motor, attaching a sharp blade to it and bolting it to the bottom of a piece of aluminum. Someone known to his friends as “stumpy” I’m sure. These portable job site table saws, in my opinion, are somewhat dangerous when left to their own devices. Often times the blade is out of alignment on one axis or another and evan if you do win the blade alignment craps shoot, often times the rip fence is of such poor quality that it may or may not seat parallel to the blade. Any of these misalignments no matter how minute can spell disaster of the most dire kind to an unsuspecting new user. I do not say this to scare or otherwise intimidate anyone from purchasing and using such a tool but rather I wish to impart to you a healthy respect for a tool that could potentially provide a means to such a rewarding endeavor. I soon realized that I needed more surface area in which to work. Not just for cutting project pieces but also for working on those projects. As I mentioned earlier, storage was at a premium. So, whatever I added to our one car garage needed to be dual purpose. It needed to be not just a tool, but also a table, a storage unit and last but not least it needed to be mobile. HOA’s do not like you using your garage for anything but a storage unit for your car. I spent a lot of time creating sketches and doodles, looking at pictures of other’s work and trying to blend ideas. I finally came to a final rough draft of what I thought I wanted, but more importantly I needed not just a work table, but a work station. Their was only one problem. I had no plans. I had spent all this time thinking up everything I wanted like some child waiting to see Santa at the mall that I didn’t realize that I had no idea of how to build this imaginary creation of mine. No diagrams, no cut list, no step by step tutorial providing easy to follow instructions. So I did what any good fledgling DIY’er/woodworker would do…I faked it. I built it in 3 sections and joined them together. The bottom has been reinforced with a 2x4 frame and double locking casters were added to keep it in one place and allow it to be mobile at the same time. I thought a larger cabinet would be ideal for storage of my more commonly used tools. The middle base cabinet was originally outfitted with a pull out drawer that was to be home for scrap wood. Directly underneath the saw I drilled a series of holes about ½ inch in diameter and enclosed a sloping 3 inch section underneath that. I drilled an outlet on the back so my shop vac hose could be attached and provide some dust collection. The final section had 4 drawers for various items. The 4 drawers dropped to three once I installed a bench vise on the side of the workstation and as for the scrap wood storage under the saw… that worked about as well as a cup holder in the door of my car, holds 12oz cans well, but who drinks 12oz cans anymore. So its been about 10yrs since I built this workstation and I must admit, it has served me well. However, I’m beginning to move into more advanced projects both woodworking and DIY in general, so I think its also time that I gave the workhorse of my workshop a few upgrades in order to help meet the challenges ahead. A new work surface to span the entire width of the station. A rip fence for more accurate cuts. An out feed support for safer cuts. 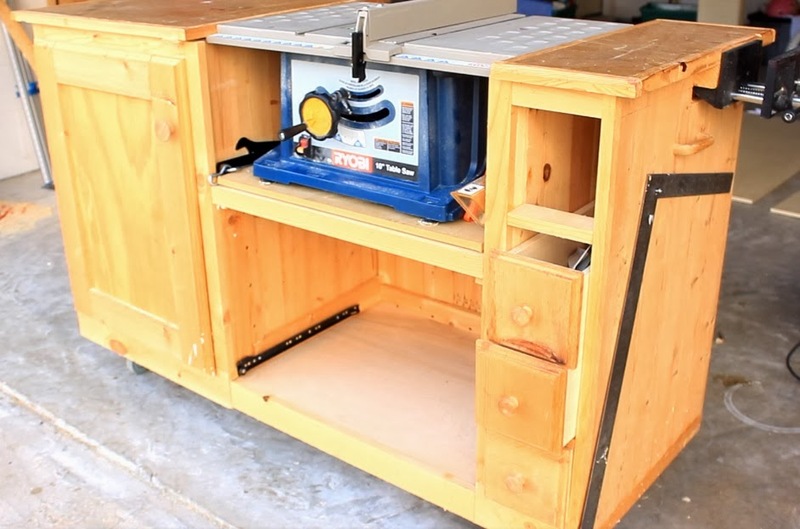 A new DIY bench vise and a redefined storage system. It will be just the beginning of a Pandora's box of DIY projects. Some, I predict will be a great success while others will be destined to fail miserably. Whatever the case may be, I know one thing will always be true... the decision to DIY will be simply, easy. I cannot find the plans & cut list for the Tablesaw Workstation anywhere on the simplyeasydiy.com website. Can you help?